If you're restoring a ride or have an all original 30+ year old piece sitting in your garage, chances are the weather stripping is not in good shape or just not there at all. SoffSeal designs and manufactures their high quality weather stripping to fit just like OE including any needed factory type formed end moldings. 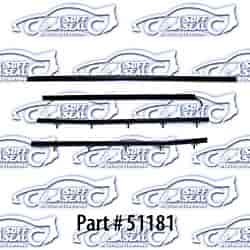 Does SoffSeal 51181 fit your vehicle?